Unique Moments photography of Gig Harbor Washington covered this wedding in Edmonds Wa. The reception was wrapping up and we knew that the sunset was about an hour away. So we convinced our Bride and groom to go out for some sunset images for the album. We captured their engagement photos at this location so we knew we could get some good shots with the sun going down. 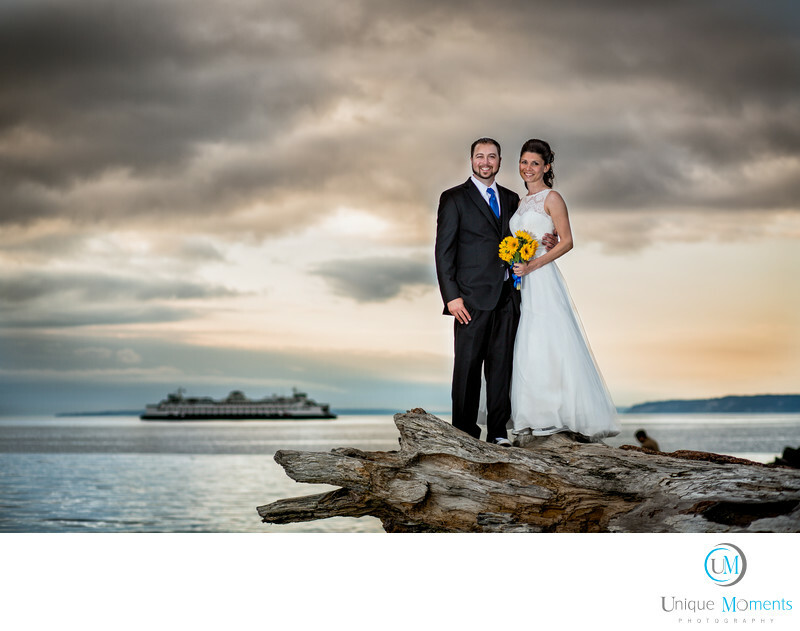 When it is possible, we prefer to get the bride and groom our for sunset shots. The images are used to close the wedding albums. Sunset Images always work, the lighting is always flattering and its great to have them in the wedding day images. We are going ask. We are going to get it on the time line schedule. Sunset Images should happen if at all possible on your wedding day. Make it a priority. Location: 470 Admiral Way, Edmonds, WA 98020.